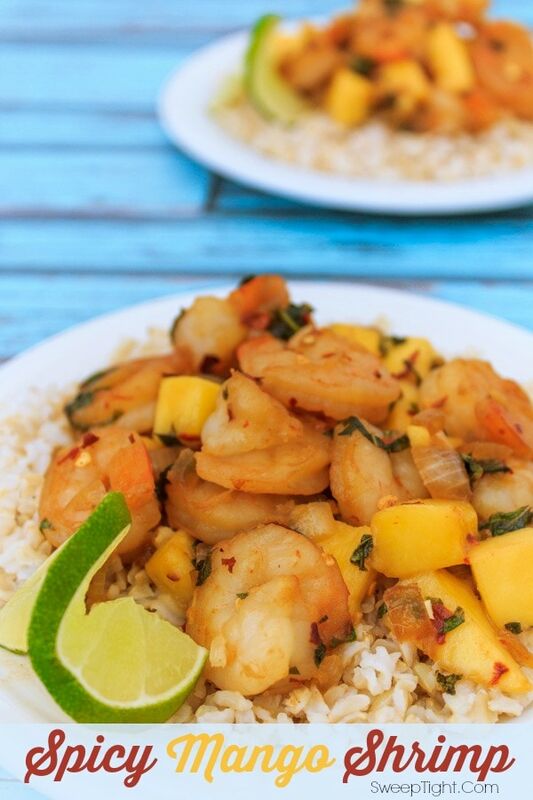 This Spicy Mango Shrimp is the perfect quick and easy meal to make using all the fresh fruit and veggies that are ripe and in season! Sweet mango cools the spicy kick of the shrimp making each bite perfection. Serve over a bed of brown rice for a light dinner. This meal is prepared using just a few ingredients. The mango is what takes the shrimp to another level. If you’re looking for new ways to serve up shrimp, definitely give this recipe a try. The hubs is always requesting shrimp dinners. I don’t know many ways to prepare shrimp, so it’s fun to experiment with different flavor combinations and interesting recipes. If you have any tasty shrimp dinner suggestions, please let us know in the comments below. An easy seafood dinner perfect for summer. In a large frying pan, heat 2 TBS Olive oil over medium heat. Add onion and garlic and saute until they start turning golden brown. Add soy sauce, basil, red pepper, lime juice. Stir and cook for just about 3 minutes. Add shrimp. If frozen, cook until heated. If fresh, cook through. Should be just about 4-5 minutes. Finally, add in mango. Mix until completely coated. Stir occasionally so they warm evenly but do not allow them to get ‘mushy' Because, yuck. For a nice summer dinner, serve over brown rice. Enjoy! We made spicy mango shrimp for dinner and took it outside to eat. I had a frozen margarita and my hubby enjoyed a cold beer. We watched the sunset and had quite a nice little date night in! It’s a perfect recipe for 2. If you double the recipe and use a smidgen less red pepper, it’s a great way to get the kiddos to enjoy new foods! The sweet mango is a sure shot to get them to enjoy seafood. The end of Summer will be here before we know it, this is 1 of those ‘must have’ dinners you should enjoy before the cold weather creeps back in! If you like recipes like this, please subscribe to the blog. Also, share this recipe with your friends and family if you think it’s something they’d enjoy. Ready for some Spicy Mango Shrimp? Let me know how yours turns out! Yes I am definitely ready for some spicy mango shrimp. Thank you for sharing this recipe. 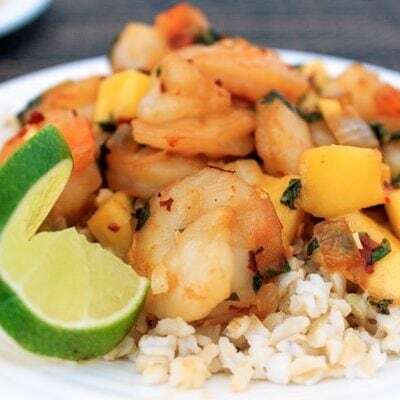 I love mangoes in recipes and this shrimp and mango recipe looks so delicious and easy to make. I will like to make this and have it for a nice Summer dinner. I love mangoes and I bet that is what totally makes this dish! Yum! I do not eat seafood but I like the idea of cooking with the mangoes. Why do I not live close enough to you to come over for dinner? I would pop in just in time to have this. I love shrimp! I don’t care for mango, except when combined with ‘spicy’ flavor offerings like this- it sounds delicious! This looks so good. It’s the perfect meal for a summer evening. Yum! This looks delicious. I love the mango and shrimp pairing. Oh my goodness, my mouth is officially watering. I love anything with shrimp then you had to go and add mango and wow! Will have to give it a try. I haven’t tried cooking with mango. I bet the sweet flavor is perfect with the sweet shrimp. I’ve been on a mango eating spree lately as I LOVE them. I haven’t tried it with shrimp, though. I am all about easy dinners–and it’s just that much better it’s seafood. Shrimp is one of my faves! I can’t wait to try this recipe. I love a sweet and spicy dish! O MY GOSH!! I’m sooo making this dish for my hubby! He would go crazy over it! That sounds really good. I love all the flavors combined together. This is the perfect dish for my hubby! He loves shrimp and mango. What a great recipe. Cooking with Mango really adds a new favor. I can’t eat shrimp so I’d make with something else. This looks so good and perfect for a summer recipe. I’l be pinning it – so good! 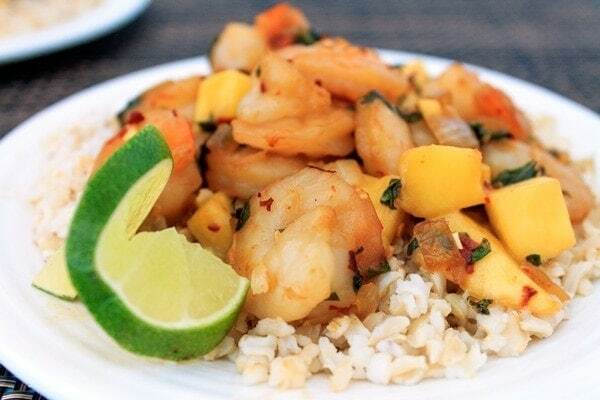 LOVE mango and shrimp! What a delicious combination, they pair well together! This looks really good. I cook something a little similar without spicy. I will have to try your version. Mango and shrimp sounds like a delicious combination. I am going to add this to my must make list. Thanks for sharing. OHH, my husband would love this!!! MMM. Oh yum. My husband would just love this!!! This looks really good! My friend would love this. I’ll have to share it with her. I love mango,this would be perfect for saturday movie night tomorrow,thanks!! This looks yummy. All I need is is a mango and they are cheap right now. Mango, shrimp, and lime! I can’t resist a recipe full of my favorite things. It makes me wonder why I’ve never combined mango and shrimp before. Thanks for the idea! Visiting from SNF. I love any recipe that uses mangoes. Especially since I have so many in my freezer. I am sure fresh is better, but I will try with frozen ones and see what happens. I love recipes that are easy and look great. I think my family would love this. I love mangoes and I bet it is going to tasty. Yum!! Looks fresh & delicious! 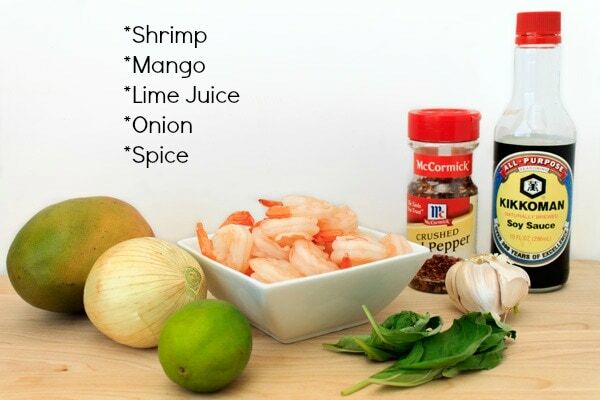 We love shrimp and mangoes I bet this taste fantastic!! Definitely will be trying this recipe. 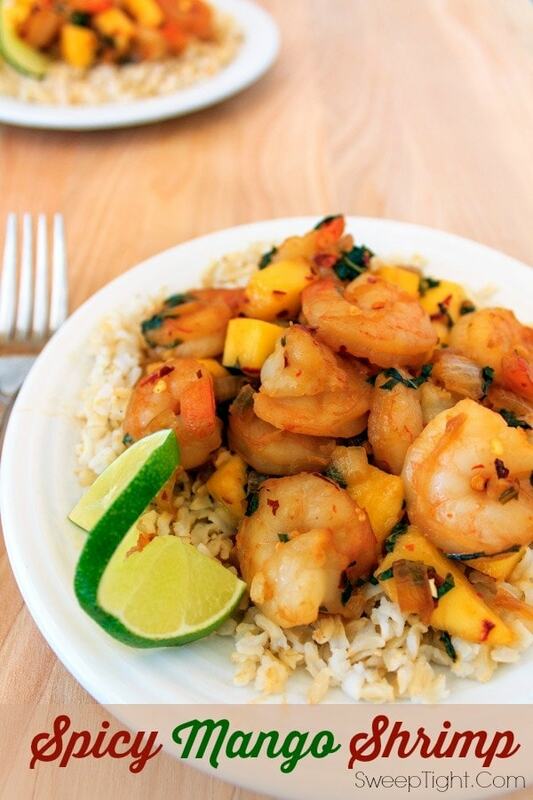 Spicy Mango Shrimp Recipe does seem very tasty! I would enjoy this recipe and my husband also.